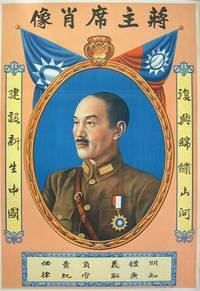 This interesting poster shows a bust of Chairman Chiang Kai Shek in an oval device surrounded by a decorative border with crossed flags in the background. The rest of the text, all in Chinese, reads To build a newly emerging China, Restore the land of splendour, To understand propriety, To know righteousness, To be responsible, To observe discipline. Measures approximately 76 x 53cm. .